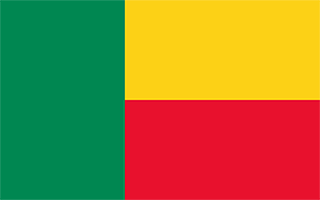 Benin with its capital Porto-Novo is located in Africa (Western Africa, bordering the Bight of Benin). It covers some 112,623 square kilometers (slightly smaller than Pennsylvania) with a population of 11,038,800. French is the official language spoken by people in Benin. Burkina Faso, Niger, Nigeria and Togo are bordering countries. Benin is a great country to visit on any West African itinerary. You'll find a large quantity of palatial ruins and temples of the once powerful Kingdom of Dahomey (1800s–1894). The national parks of Benin are also well worth a visit for their wildlife. The best time of the year to visit the country is from November to February, when the temperature moderates, and the weather is dry with low humidity. Benin is also, fortunately, one of the most stable and safe countries of the region for traveling. Visas can be single entry ($40USD) or multiple entry ($45USD) and last 30 days. Visas cost $100 for US citizens. The topography is mostly flat to undulating plain with some hills and low mountains. The average density of population is about 98 per km². The climate in Benin can be described as tropicalhot, humid in south, semiarid in north. Potential natural disasters are hot, dry, dusty harmattan wind may affect north from December to March. To reach someone Benin dial +229 prior to a number. The local cellular networks are operated on 900 MHz, 1800 MHz, 3G, 4G. Websites typically end with the top level domain ".bj". If you want to bring electric appliances (e.g. battery chaarger), keep in min the local 220 V - 50 Hz (plugs: C, E). The sign for the locally used currency Franc is XOF. Two equal horizontal bands of yellow (top) and red (bottom) with a vertical green band on the hoist side; green symbolizes hope and revival, yellow wealth, and red courage. Present day Benin was the site of Dahomey, a West African kingdom that rose to prominence in about 1600 and over the next two and a half centuries became a regional power, largely based on its slave trade. Coastal areas of Dahomey began to be controlled by the French in the second half of the 19th century; the entire kingdom was conquered by 1894. French Dahomey achieved independence in 1960; it changed its name to the Republic of Benin in 1975. A succession of military governments ended in 1972 with the rise to power of Mathieu KEREKOU and the establishment of a government based on Marxist-Leninist principles. A move to representative government began in 1989. Two years later, free elections ushered in former Prime Minister Nicephore SOGLO as president, marking the first successful transfer of power in Africa from a dictatorship to a democracy. KEREKOU was returned to power by elections held in 1996 and 2001, though some irregularities were alleged. KEREKOU stepped down at the end of his second term in 2006 and was succeeded by Thomas YAYI Boni, a political outsider and independent, who won a second five-year term in March 2011. Patrice TALON, a wealthy businessman, took office in 2016 after campaigning to restore public confidence in the government.